Instil a sense of style and opulence to your garden this summer by adding an elegant gazebo. A gazebo can provide a magnificent focal point to larger gardens, but can also offer a multi-functional outdoor space on warmer days. Use it for social occasions such as a relaxing afternoon tea, a garden party, a summer lunch with friends and family, or use it as a simple, quiet little garden retreat, a cool place to read a book on a hot summer’s day. 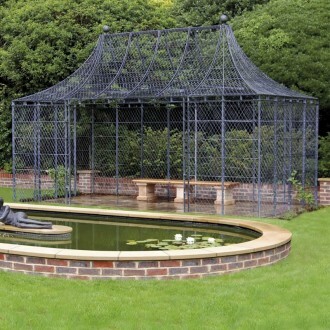 We offer a range of arch, window or full lattice side panels, and can design a dream garden gazebo just for you. Unlike less attractive wooden models which can look incongruous in a garden landscape, our gazebos are unobtrusive and complement any style of larger garden. Swathe in climbing plants for beautiful blooms and shady foliage in summer or create a romantic arbour by adorning with scented ramblers. As climbers grow over it, your gazebo becomes a natural part of the garden and blends beautifully into the landscape. Even before the climbers have had a chance to grow, the latticework and classic pared down design of our metal gazebos will create a visually stunning feature all of its own.